Round up friends & get Twangled! Round up your friends and prepare to get Twangled! Laugh, think, stretch, and communicate to get your group in & out of a twisted and tangled situation. To play, simply grab the bands and stand in circle. Kick the spinner and follow the instructions, stepping over or under a specified band color. 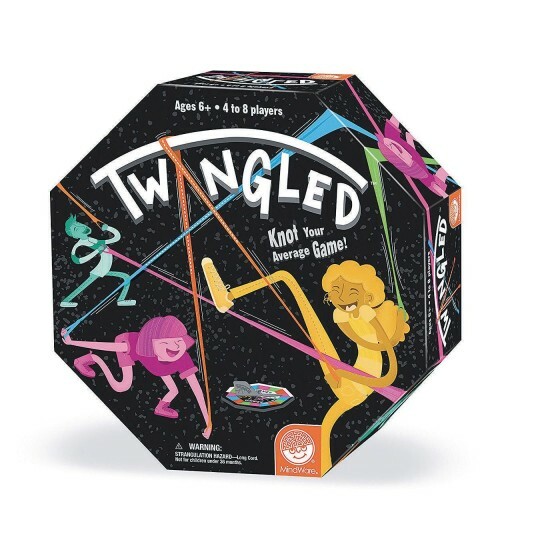 With each spin, your group becomes more and more Twangled. Then it’s time to work together to untangle the group back into starting positions! This team-building game develops problem-solving skills and gets everyone up and interacting. Includes 8 elastic bands, 1 kick spinner and rules. For 4 to 8 players.